It’s the last weekend before Valentine’s Day and people will be hitting the stores to find last-minute outfits for date night, Galentine’s celebrations or just … staying home. We stopped by the South End location of Goodwill’s GW boutique (3609 South Blvd.) with our friend and fashion insider Stacee Michelle to find stylish looks for whatever your Valentine’s Day weekend might bring! If you like these looks, you’re in for a treat. We’re partnering with our pal Stacee to curate fashionable finds from a different Goodwill store every month for you to purchase! 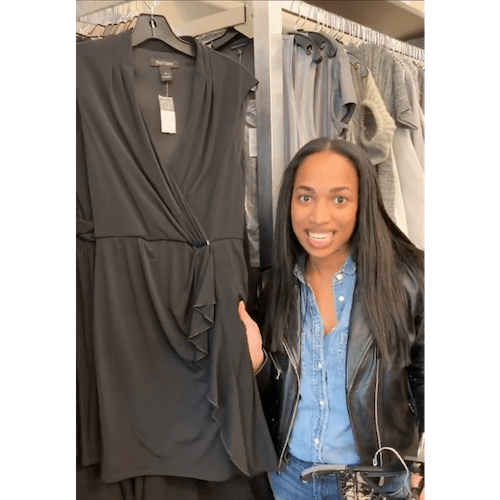 At noon on the first Friday of the month, a rack of clothes that were “Styled by Stacee” will be released in a Goodwill store so you can bring some of Stacee’s style inspiration to your own wardrobe. The February “Styled by Stacee” rack will be released at the GW boutique in lower South End at noon on Friday, February 8! Follow us on social media @GoodwillSP to get a sneak peek of all of the items Stacee found this month! You can also tune in to Good Day Charlotte on FOX46 Friday, February 8 at 8 a.m. to see Stacee show off some of the looks you can buy in the store today. While we were shopping for this month’s “Styled by Stacee” finds, Stacee taught us these five top tips for shopping this Valentine’s Day, and every day! 1. Don’t shy away from the traditional “colors of the season”. Red, pink, ivory, black and grey are great for Valentine’s Day, but they’re also trendy colors that will carry into spring! We love this casual night out look Stacee found – it’s perfect for drinks or a low-key date setting. The roses on this Express blouse add a hint of “Valentine’s Day” and the deep red accessories and ripped jeans will be great additions to your spring wardrobe. 2. Embrace the LBD. For your dinner date outfit, look for a little black dress with some stretch. Stretchy materials won’t wrinkle while you’re sitting and a little bit of give means the dress will still be flattering after a big meal! Stacee found this lovely LBD by White House | Black Market with a great neckline and cinched waist that would be flattering on any figure! 3. Don’t be afraid to mix seasons! Seasonal style is whatever you want it to be! If you have a great summer dress you want to wear – add wintry accessories to bring it into this season. 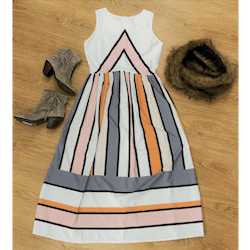 Stacee found this dress with bold stripes and neutral colors and paired it with this faux fur stole and suede booties! She also taught us the word stole – it’s what you call a scarf or shawl you drape loosely over your shoulders! 4. Don’t shop for one day. 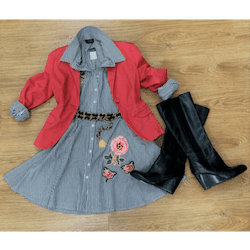 Find outfits and pieces that you can pair with other items in your closet to wear any day – not just on a special occasion! We love this feminine ruffle blouse by ELLE that Stacee paired with a textured tweed skirt featuring bold suede borders and matching suede booties with a cool leather accent strap! 5. Pick out textures and patterns that speak to you. When you’re shopping the racks, you don’t have to look at every item – just search for textures, colors and patterns that jump out at you! Then build an outfit around them. This striped dress jumped out to Stacee and the trendy floral embroidery sealed the deal! Paired with this pink jacket and black Franco Sarto wedge boots it becomes an ideal work outfit that can transition to happy hour! 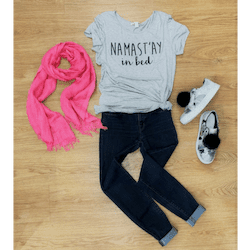 Bonus look: If you’re not celebrating Valentine’s Day – or would rather honor the day by hanging out on the couch with a tub of ice cream (no judgements here)… Stacee also styled this bonus outfit with a sassy graphic tee and dark wash J Brand jeans (score!) Paired with fun pompom sneakers and a soft pink scarf, it’s the perfect outfit to veg out in! If you like these looks, these pieces and even more items hand-picked by Stacee will be available for purchase at the GW boutique in lower South End starting at noon on Friday, February 8! Remember to check back each month to see where you can find looks Styled by Stacee!